1) This paper is a peer review paper that was presented at the FIG Working Week 2017. Fixed geometric constraints, imposed by man-made structures, weather influences, etc., make it possible to restrict positioning. In this study, these problems will be subjected to a number of tests and a low-cost solution will be offered. The advantage for the development of a positioning solution for indoor parking facilities management relates to the fixed geometric constraints imposed by man–made structures, the minimal weather influences and the low vehicle dynamics. Furthermore, easy access to commodities such as electrical supply and internet can facilitate further the use of alternative localization procedures. Nevertheless, other factors, including the severe multipath conditions and the high attenuation and signal scattering effects, as well as the extended non–line–of–sight (NLoS) conditions make the positioning problem a difficult and case dependent task. This study offers a low–cost positioning solution to the problem relying primarily on the RFID Cell of Origin (CoO) technique resulting into a discrete point vehicle trajectory. Then, Wi–Fi Receiver Signal Strength (RSSI) observations act as a supplement to fill in the gaps and refine in a dynamic manner the final continuous vehicle trajectory. Also, this study introduces the concept of using UWB technology as a means of supporting the RFID/Wi–Fi solution through dedicated check points of higher positioning accuracy given its high accuracy potential and the continuously decreasing system cost. A number of tests have been undertaken to examine the validity and the potential of this approach and results of the analyses are presented. It could be proven that all major user requirements (i.e., positioning accuracy, availability, continuity) are being met. Positioning requirements for indoor localization can vary extensively depending on application type and scope of a particular study. Therefore, the selection of the appropriate positioning techniques and the allocation of suitable technologies to address the problem necessitates a thorough designation of well–grounded figures of user requirement parameters. For the case of traffic modelling studies within large–scale, multi–storey indoor parking facilities and depots, positioning requirements range from very loose to more stringent ones, as the level of detail in simulation increases from macroscopic to mesoscopic and microscopic scale respectively (Kladeftiras and Antoniou 2013, Antoniou et al. 2011). This study deals with the positioning problem associated with the traffic modeling concerning the management of indoor parking garages at a microscopic level. As a result, the extraction of vehicle trajectories and the measurement of their kinematics becomes crucial for the calibration of the underlying transportation models. Previous studies have employed various technologies to address the localization problem within indoor parking facilities. Certain solutions comprise the use of LD–LRS lasers (Kümmerle et al., 2009), environment–embedded LIDAR sensors (Ibisch et al., 2013) as well as Ultra Wide Band (UWB) systems (Baum, 2011). However, more recently, low–cost approaches become more popular. For instance, Bojja (2013) proposes the use of a gyroscope and an odometer sensor system interacting with a 3D map database, while the approaches proposed by Alam et al. (2015), Shuaib et al. (2015) and WLAN Positioning Technology (2014) rely on WLAN measurements. The authors, in a number of recent studies (Gikas and Retscher 2015; Gikas et al., 2015; Gikas et al., 2016a; Antoniou et al., 2017) have proposed and tested a positioning system that primarily relies on the RFID (Radio Frequency Identification) proximity detection technique aided by Wi–Fi monitoring. 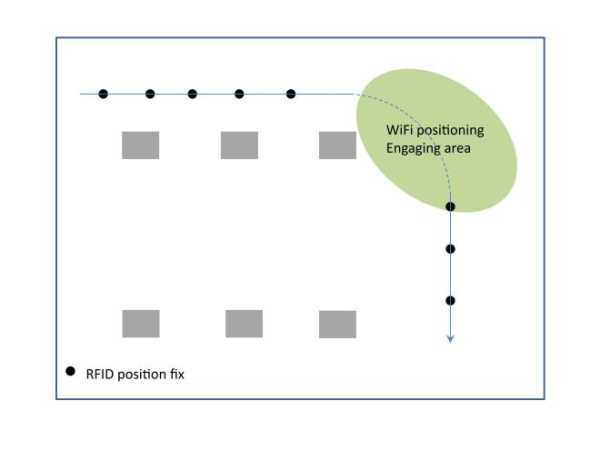 In this approach, the RFID is used to provide a core solution for vehicle positioning, while the Wi–Fi acts in parallel for verifying this localization solution and potentially filling the gaps where necessary. In this study, we propose an extension to this method aiming at further improvement of the vehicle navigation solution, particularly in terms of availability and coverage. To this effect, we utilize the RFID–derived vehicle trajectories to compute Wi–Fi radio maps in the area of operation using the empirical fingerprinting technique. These maps are updated dynamically when an RFID solution is available, while in the case of RFID outages they are used to serve vehicle localization, leading overly to a more robust positioning solution. Finally, additional considerations aiming at further improvement of the method are discussed. These are based on the concept of DWi–Fi (Retscher and Tatschl, 2016a; Retscher and Tatschl, 2016b) and the use of the UWB technology respectively. As already stated, this research aims at serving the localization needs associated with the calibration of the transportation models concerning the management of large–scale, indoor parking facilities. Particularly, the interest focuses in cases of near–capacity demands, temporally constrained arrivals / departures and for emergency evacuation. In fact, the microscopic scale of the analysis adopted in this approach, calls for an adaptive vehicle localization scheme based on space–signal behavior. This should encompass analyzing the performance of the localization and data processing methods in terms of performance and complexity trade–off and shall also include development of intelligent algorithms / software for the optimal use of different positioning methods to ensure localization in complex environments. Four types of user requirements one should consider for the development of an indoor localization system; namely, positioning, interface, cost as well as security and legal requirements. Particularly, positioning requirements comprise of several parameters including accuracy, availability, integrity, coverage and continuity. In the problem encountered in this study, despite the great importance of positioning accuracy, other parameters, particularly position solution availability, coverage and continuity are of vital importance to the calibration and verification of the transportation algorithms. Vehicle positioning accuracy, generally is required in the level of a meter or so, while the direction of movement is also important to compute in real–time. 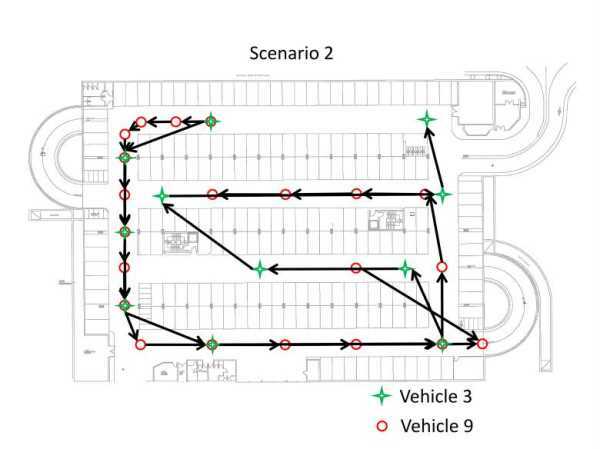 Finally, vehicle topology (i.e., spatial distribution of vehicles) in a parking facility and its variation with time provides useful information to control traffic modeling algorithms. Position fixing indoors can be accomplished using various techniques depending on the type of measurements and the environmental conditions. The most common ones are the Cell–of–Origin (CoO) or proximity detection, lateration, fingerprinting, dead–reckoning, and map–matching. Here, the emphasis is placed on the first three techniques as they suit better to the sensor technologies adopted in this study. Table 1: Characteristics of the CoO, empirical fingerprinting and lateration techniques. The CoO technique is used to determine the position of a mobile asset within its range of operation through identifying the location of the anchor point (e.g., RFID reader, Wi–Fi access point (AP)) which exhibits maximum RSSI (Receiver Signal Strength) value. Notwithstanding the CoO technique is very simplistic at an implementation stage, its accuracy standard is low compared to other techniques (Table 1). Location fingerprinting (FP) relies on RSSI maps constructed at a training phase to depict the distribution of RSSI at an area of interest. At a second stage the measured RSSI values are cross–compared against the reference ones that implicitly correspond to a position fix. FP generally provides a medium to high accuracy standard, nevertheless the training phase can be time consuming and costly. Finally, the use of the lateration technique resides on computed (in the considered case from RSSI measurements) ranges that connect the unknown location of a user to control points fixed at known locations. The level of accuracy of the method is mainly affected by multipath due to obstacles in the environment that contaminate the RSSI measurements. An RFID is a radio frequency (RF) system that can be used for object and pedestrian detection, positioning and tracking. It employs a reader operating in the frequency band from 300 kHz to 30 GHz. The reader’s antenna interrogates an active transceiver or a passive tag to get its unique ID number and a measure of RSSI. Most RFID systems rely on the proximity detection of tags to locate mobile readers (direct approach), or alternatively, the tags can serve as control points to track moving readers (reverse approach) (Gikas and Retscher, 2015). Some long–range active RFID systems can also use RSSI information to improve the localization accuracy (Mautz, 2012; Gikas et al., 2016b). Wi–Fi is an IEEE 802.11 wireless local area network (WLAN), which can be used for locating an object within its range (usually 50 m to 100 m) of operation. Localization can be accomplished using either the CoO, fingerprinting or lateration technique. However, due to the highly dependence of RSSI values to the operating environment caused by multipath and scattered signal, a conversion of RSSI values to distances is usually very difficult to achieve (Mautz, 2012). Therefore, the most popular technique for Wi–Fi positioning is the empirical fingerprinting, which nevertheless, perquisites a training phase to build a reference Wi–Fi radio map that is then used as a basis to associate measured RSSI values to position fixes. 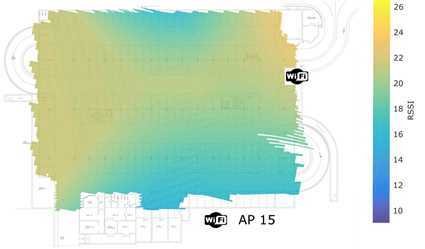 Finally, the quality of Wi–Fi positioning depends on the number and the geometry distribution of APs in the area of operation. In order to test the correctness and the feasibility of the proposed approach an extensive field campaign has been undertaken in a multi–storey parking facility in Athens, Greece featuring a total of ten passenger vehicles. This section discusses the data acquisition procedures undertaken and the results of the analyses obtained. In this study we employed an active RFID system produced by Freaquent® Froschelectronics GmBH (Gikas et al. 2016b). It features the HTEV 600 reader with a Tx LF triggering antenna and an Rx UHF antenna to receive the RF signals transmitted by the ETS active transponders (tags). The experimental configuration involved setting up the RFID readers onboard the vehicles, while a great (>25) number of tags were hooked at predetermined locations from the ceiling. Moreover, in order to ensure a good signal reception, the receiver antennae were placed externally and on the roof top of each vehicle. Data recording was performed in laptop computers running a custom logging software, whereas time synchronization was achieved through the local wireless network time. Regarding WLAN positioning, three Wi–Fi scanners were deployed in the parking area to monitor the RSSI information captured by a smartphone placed on-board every vehicle. For this purpose, each smartphone’s unique MAC address was documented and assigned to the corresponding vehicle. Time synchronization was performed using the local wireless network time. As discussed already, the positioning coverage that the CoO technique can attain is limited by the number of available tags and their maximum range of operation. 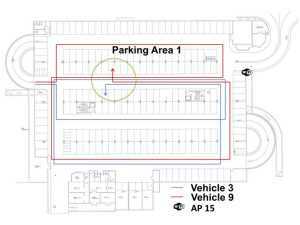 However, for the case of this study, the rather canonical arrangement of the RFID tags placed alongside the parking corridors, serves as a backbone to the proposed localization system that helps to increase the final positioning reliability. The local coordinates and the unique ID for all RFID tags are stored in a database. When a vehicle performs a trajectory, the RFID reader detects sequentially the IDs of the ceiling–mounted tags as it passes by them and a time–stamped record is created. Finally, the vehicle trajectory is depicted in a local coordinate system using the individual point fix recordings. It is recognized that fusing plan diagram information with sensor-derived location data would improve the navigation solution; however, map-matching is out of the scope of this study. Experimental testing involved the implementation of various operational scenarios. Depending on the content and scope of each individual test trial, a different number of vehicles was participated leading to either a single, dual or multiple vehicle scenarios. This study confines in two scenarios that each one involves two vehicles. 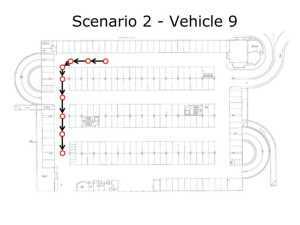 Figure 1: Typical trajectories of two vehicles recorded using the RFID CoO positioning system. Figure 1 shows the vehicle trajectories obtained using the RFID CoO technique from two vehicles traveled at low speeds. Clearly, despite the missing information at certain sections, vehicle kinematics including average velocity, inter–vehicle distances and total travelled distance is merely some of the available information that can be stored for each vehicle. Obviously, point fix spacing between sequential recordings is limited and constrained by the inter–tag distances. Notwithstanding tag locations were carefully selected at a design stage to accommodate the nominal tag–reader operation range, data analysis has indicated that vehicle velocity can impact substantially tag detection. Figure 2 shows a part of the recorded trajectories for two vehicles following the same route at different velocities. Evidently, the navigation solution for a vehicle driving at higher (16 km/h) velocity (Figure 2, left plot) results in a sparser vehicle trajectory compared to that obtained for a vehicle driving at a slower (9 km/h) velocity (Figure 2, right plot) indicating the limitations of the method. As shown in the previous section, despite the fact that the RFID system can serve as a basis for vehicle localization within indoor parking facilities, user requirements of positioning availability and coverage depend heavily on tag spatial distribution and density as well as on vehicle velocity. Today, thanks to the Wi–Fi communication infrastructure embedded in contemporary smartphones, it becomes possible to consider such information for assisting the RFID CoO vehicle navigation solution indoors. Figure 3 offers a qualitative evaluation of the RSSI values captured by two smartphones placed on-board the vehicles discussed in the previous section (LG L5 II and Samsung Galaxy S3 for vehicles v3 and v9 respectively). 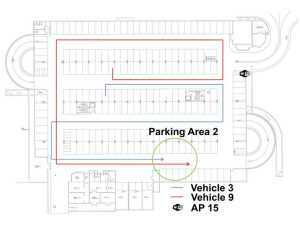 As shown in the left plot of Figure 3 the two vehicles enter the parking area from the left, they perform somehow different routes and park at nearby locations in “parking area 1”. They remain stationary for a period of about 7 min and then they perform a second run via different corridors, and finally come to a stop at “parking area 2” (Figure 3, right plot). The corresponding RSSI time series received by the Wi–Fi scanner AP15 are presented in Figure 4. In this plot, the stopping times at “parking area 1” and “parking area 2” refer approximately at ti: 6150 s and tj: 6550 s respectively. From Figure 4 it is evident that despite the similarity in the Wi–Fi RSSI time series pattern, the differences in absolute RSSI values between the two smartphones reveal that Wi–Fi raw RSSI is unable to provide accurate range measurements. Interestingly, this also applies for the stationary locations for which both vehicles were parked at nearby locations. In fact, the operating environment encountered within indoor garages affects substantially the stability of the obtained Wi–Fi RSSII values due to static (e.g. walls, pillars) and dynamic (e.g. vehicles, people) obstacles that generate shadowing and multipath effects, which by extension degrade the RF signal propagation. As a result, the complexity imposed by the continuously varying RF environments does not allow the establishment of stable RSSII–to–distance models making a real challenge the use of the lateration positioning technique for Wi–Fi positioning. Therefore, alternative positioning techniques deemed necessary, particularly empirical fingerprinting. The first step in implementing the fingerprinting technique is the generation of a RSSII reference map. In order to generate the RSSII training maps, the RFID–logged positions are associated with the Wi–Fi RSSII values recorded at the same timestamps. 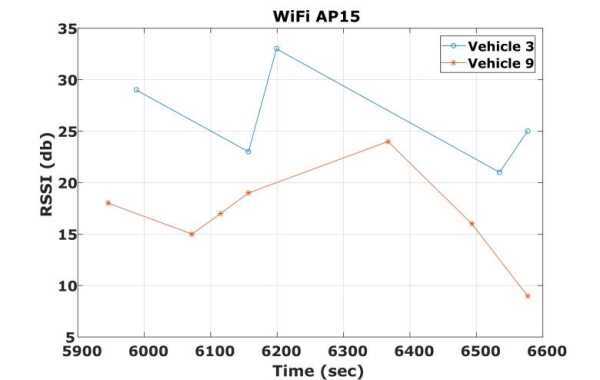 Notably, the Wi–Fi scanning sessions are detected on average every 2–3 min (see Figure 4) as the sampling rate of the Wi–Fi scanners depends on the Wi–Fi activations of each mobile device. Sample trials have indicated that the minimum time offset observed between the RFID and Wi–Fi time records is of the order of 3 s. Therefore, the time mismatch between the RFID and the Wi–Fi sub–systems is compensated by accepting values coinciding within a ±3 s time limit. Furthermore, considering that the average vehicle velocity in these trials is of the order of 9 km/h, the maximum position error for the obtained RSSII values falls within the step distance between subsequent tag (7.5 m). Figure 5 shows the RSSI radio maps obtained for the smartphones placed on–board two vehicles. Clearly, the very limited common RFID / Wi–Fi data do not allow the generation of a radio map that covers the entire test area. However, these representation provides useful insight for the design of future data collection sessions. Examination of Figure 5 in more detail, reveals that despite the sparse RSSI information, the spatial distribution of RSSI values is somewhat associated with the characteristics of the indoor environment. This is particularly evident in the left plot of Figure 5, in which the RSSI radio pattern follows the actual corridor geometry in the parking lot. Moreover, the actual RSSI values obtained by the two smartphones seem to be quite similar; for instance, examine the RSSII values (i.e., 21.5 db versus 22.0 db) obtained by the north–eastern corner of the parking area. An extension to the previous analysis forms the implementation of advanced interpolation methods, such as the Voronoi technique (Gavrilova, 2008), the implementation of which for vehicle v3 leads to Figure 6. Notwithstanding Voronoi technique is not the ideal approach for interpolating irregularly spaced data, the resulting radio map describes adequately the RSSII conditions shown in Figure 4. These findings indicate the potential of Wi–Fi fingerprinting, even for complex indoor environments. Experimentation with alternative extrapolating techniques is necessary in order to optimize the training phase of Wi–Fi fingerprinting. Based on the analyses and the test results obtained with the RFID CoO and Wi–Fi systems, a conceptual approach of a positioning system design is proposed in this section. Overly, the proposed positioning system relies on RFID CoO derived positions and Wi–Fi RSSII maps generated at an initialization training phase. More specifically, the complete positioning approach is divided in two parts. The first one utilizes the RFID CoO technique for obtaining the primary positioning information, while it engages the Wi–Fi monitoring technique for the sections lacking RFID positioning. The second part refers to a dynamic radio map updating concept that continuously compensates for the temporal RSSII variations usually found in dynamic indoor environments. Thereby, during the first part, the position solution of a vehicle is determined relying solely on RFID CoO position fixes. For the occasions that RFID does not provide a position solution for a certain amount of time, either due to a lack of RFID tag coverage or missed detection of tags, the navigation system automatically engages the Wi–Fi fingerprinting positioning technique. Despite the fact that the position accuracy provided using the Wi–Fi radio maps is inferior to the RFID technique, it still enables continuous positioning until a new RFID position fix becomes available or until the vehicle is identified being in a “stationary state”. Figure 7 illustrates the previous example. In this plot the black dots represent the RFID CoO vehicle positions fixes. Here, while the vehicle performs a right turn it does not detect any RFID tag. As a result, soon after, the navigation system engages the Wi–Fi fingerprinting mode, while it attempts continuously to scan for new tag detections. Subsequently, the system continues to perform in this mode until a successful RFID position fix occurs, and then the positioning responsibility returns back to the RFID system. Notably, during the stage for which positioning is performed using the RFID system, the Wi–Fi fingerprinting database is continuously updated using all information available from the vehicles in the operating area. The flow chart of Figure 8 describes the main steps of the proposed system. Specifically, a mobile vehicle is tracked continuously using the RFID CoO technique, while at the same time is monitored by the Wi–Fi scanners that record the respective RSSII values. This information is processed in near–real time for quality control (outlier rejection) purposes and the respective information is stored in the existing radio database. In the case for which RFID positioning becomes unavailable, vehicle positioning relies solely on Wi–Fi RSSI using the most recently updated radio map. At an implementation stage, it is expected that the RSSI Wi–Fi values can vary considerably between smartphones due to differences found in antenna manufacturing and due to variable effects in RF signal propagation as a function of the metallic body of the hosting vehicle. Experimental testing employing a large amount of data obtained using different configuration set–ups can provide valuable information for a better understanding of the environmental effects on the position solution. Through storing the long–term information of the dynamic radio database, further analysis of the RSSII variations it is possible that can help optimizing the system efficiency while improving positioning accuracy. Moreover, cross–comparison between the long–term temporal RSSII variations against the number of vehicles inside a parking facility, it can reveal a relationship between the vehicle loads within a facility and the Wi–Fi radio environment. Such knowledge can open the road for the creation of RSSII prediction models based on external input that can be integrated into a radio maps development procedure improving the overall system accuracy and stability. Further improvements to the main idea of the RFID CoO / Wi–Fi system for vehicle positioning indoors is possible using advanced analyses techniques and / or heterogeneous sensor data. Recent developments on Wi–Fi positioning, known as Differential Wi–Fi (DWi–Fi), have shown promising results on improving the accuracy of the fingerprinting method using distance corrections (Retscher and Tatschl, 2016a; Retscher and Tatschl, 2016b). In this approach the path–loss model errors are eliminated by differencing model–derived distances from the same AP leading to positioning accuracy of the order of 0.5 m – 1.0 m. Implementing this technique in the proposed positioning system is expected to improve its performance, provided that the required infrastructure of additional APs is possible while simultaneously preserving the cost of the system. The benefits arising from a low–cost indoor positioning system for indoor parking facilities management can be further enhanced – while increasing the overall system accuracy and robustness – if it ecompasses Ultra Wide Banded (UWB) system thanks to its high accuracy potential and foreseable decreasing costs. Based on this approach, further improvement of the proposed system would include the employment of low–cost UWB transceivers placed at each vehicle. 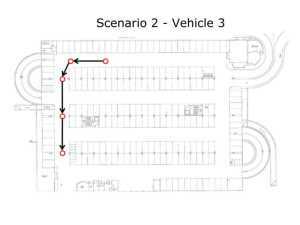 In this study, a new system approach for positioning vehicles within indoor parking facilities is presented. The system relies on the use of RFID CoO and Wi–Fi measurements. 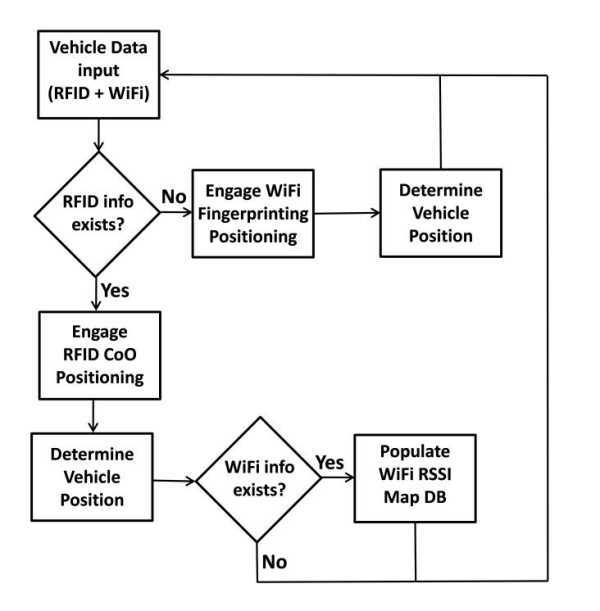 Particularly, an algorithmic proposal is introduced to provide continuous vehicle positioning based on dynamically updated Wi–Fi radio maps, while vehicle positioning is primarily obtained using the RFID CoO technique. The performance of both systems is examined using real data obtained from an extensive field campaign. Analysis reveals the high potential of the proposed approach in terms of positioning accuracy and availability, while ideas for further enhancement of the system are envisioned. Scaling up the system to greater size parking facilities or even more to an area-wide level would require tackling equipment availability issues while at the same time database creation and maintenance should be carefully planned. This research was supported by the Action: ARISTEIA-II (Action’s Beneficiary: General Secretariat for Research and Technology), co-financed by the European Union (European Social Fund –ESF) and Greek national funds. Alam, K.M. ; Saini, M.; El Saddik, A.E., 2015, Workload Model Based Dynamic Adaptation of Social Internet of Vehicles. Sensors, 15, 23262–23285. WLAN Positioning Technology 2014, White Paper, Issue 1.0, Date 2014-04-24, Huawei Technologies Co., Ltd.
Vassilis Gikas received the Dipl. lng. in Surveying Engineering from the National Technical University of Athens (NTUA), Greece and the Ph.D. degree in Kalman filtering and Geodesy from the University of Newcastle upon Tyne, UK, in 1992 and 1996, respectively. He is currently an Associate Professor with the School of Rural and Surveying Engineering, NTUA. ln the past (1996-2001) he served the offshore and land seismic industry in the UK and the USA as a navigation and positioning specialist and more recently (2001-2005) he served the private sector in a series of surveying and transportation engineering projects under the same capacity. His principal areas of research include sensor fusion and Kalman filtering for navigation and mobile mapping applications as well as engineering surveying and structural deformation monitoring and analysis. Harris Perakis is a PhD candidate at School of Rural and Surveying Engineering of the National Technical University of Athens. He holds a Dipl. lng. in Surveying Engineering from the same School (2013). His scientific interests include positioning within indoor and hybrid environments, trajectory assessment and geodetic sensor data fusion. Allison Kealy is an Associate Professor in the University of Melbourne and as been a researcher in sensor fusion and satellite positioning systems for almost two decades. Her research interests are in sensor fusion, Kalman filtering, GNSS quality control, with application in wireless sensor networks and location-based services. Guenther Retscher is an Associate Professor at the Department of Geodesy and Geoinformation of the Vienna University of Technology, Austria. He received his Venia Docendi in the field of Applied Geodesy from the same university in 2009 and his Ph.D. in 1995. His main research and teaching interests are in the fields of engineering geodesy,satellite positioning and navigation, indoor and pedestrian positioning as well as application of multi-sensor systems in geodesy and navigation. Thanassis Mpimis is a PhD student at the National Technical University of Athens (NTUA). He holds a degree in IndustriaL Management & Technology from University of Pireaus (2004), the Dipl. Ing. Degree in Surveying Engineering from NTUA (2009), and the MSc in Techno-Economical from NTUA (2007). His principal areas of interest include sensor fusion for land and sea navigation applications and deformation monitoring of structures with emphasis on GNSS and ground-based interferometry. Constantinos Antoniou is a Full Professor in the Chair of Transportation Systems Engineering at the Technical University of Munich (TUM), Germany. He holds a Diploma in Civil Engineering from NTUA (1995), a MS in Transportation (1997) and a PhD in Transportation Systems (2004), both from MIT. His research focuses on modelling and simulation of transportation systems, Intelligent Transport Systems (ITS), calibration and optimization applications, road safety and sustainable transport systems. He has authored more than 250 scientific publications, including more than 70 papers in international, peer-reviewed journals, 170 in international conference proceedings, a book and 17 book chapters.